The Green Snakes Found in South Africa - The Harmless and Deadly. There are 6 species of commonly seen green snakes in South Africa. Green Snake species commonly seen include. Angolan Green Snake – Philothamnus angolensis – an uncommon species which is not seen readily due to its small distribution. Many Spotted Reed Snake – Amplorhinus multimaculatus – typically a dark brown snake, it is known to occur in a uniform green variation. A side by side comparison of the Common Green Snakes of South Africa – Full Body. A side by side comparison of the Common Green Snakes of South Africa – Close Up Head Shots. Before I get started into the specific descriptions, key visuals and methods to identify these green snakes of of the easiest methods to the untrained eye is by a process of elimination. Take into account where you saw the snake, how many other green snakes are in the area? For example if you see a bright green snake in the Western Cape, it won’t be a Green Mamba, Eastern Natal Green Snake or a Common Boomslang simply because these don’t occur in the area. So what are your options? The Green Water Snake or the Western Natal Green Snake now look closer at the distributions of the two species and where you saw the snake. Chances are you’re able to eliminate one or the other and be left fairly confident on which snake species you saw. Positively identifying snakes isn’t rocket science but too often people ignore the simple and glaringly obvious details. Don’t over think things and take into account how common/uncommon certain species are in a given area. A slender and strikingly beautiful harmless bright green snake, with a bright orange iris in the eye which differentiates it from other green snakes. Prominent spots which may from black cross bars giving the appearance of bands or stripes in some cases. These spot/markings are typically only on the first third of the body – the remaining portion of the body is a uniform green. In the drier regions of Limpopo, North West, Northern Cape and Namibia this snake lacks the vibrant green colouration and is a muted dark green/olive colour with the last two thirds of the body being a coppery/bronze or grey in colour. One of the most common of the green snakes, often found around buildings and well adapted to suburban environments. The actively hunt geckos typically Tropical House Geckos, other geckos species, lizards and frogs are readily taken. Theses snakes often enter houses in advertivaley whilst chasing their prey. It is not uncommon for these snakes to take up residence in suitable habitat and many have been recorded staying in a particular area for several years. These are shy, nervous snakes and will often move away as soon as they are detected to the nearest tree/shrub for cover. They will strike out aggressively and bite when first handled, these bites are superficial and may draw blood which may bleed excessively for a few minutes. Spotted Bush Snake. From Durban, Kwa-Zulu Natal. Spotted Bush Snake. From Windhoek, Namibia. Spotted Bush Snake. From Umhlanga Rocks, Kwa-Zulu Natal. Distribution of the Spotted Bush Snake. A small shy nondescript and inoffensive green snake. These snakes favour damp localities such as shaded streams, dense bushes and shrubs where they will actively hunt prey during the day. A uniform green snake which may have the appearance of being a pastel green, the belly is white and often will have a prominent yellow snout. A fair less arboreal snake than the other green snake spending less time in trees and shrubs. They can often be found sleeping amongst the foliage at night on game drives and by herpetologists out frogging amongst the reeds in dams and ponds. When handled they will seldom attempt to bite and on ocasion may inflate the neck region and strike out in self defence but this is not common amongst the species. A slender snake at just 50-60cm these snakes prey on small amphibians, geckos, lizards and occasionally fish (cited) a large green water snake could be in the region of 60-70cm however they are said to reach 1m however I’ve never seen a specimen close to this size. Hatchings are minute at between 12-15cm. These snakes may be easily confused between the Eastern Natal Green Snake which has a prominate keeled ventral scales and a green belly as apposed to teh green water snake whihc has a pale/off white belly. Green Water Snake. From Durban, Kwa-Zulu Natal. Distribution of the Green Water Snake. An active, alert and beautifully coloured green snake, occasional with black cross bars on the back of the neck which may form stripes/bands and adding to the confusion of the Spotted Bush Snake. Having a much shorter head and a yellow iris of the eye which is distinct from the Spotted Bush Snake. A much more robust snake that the similar Spotted Bush Snake which it is often mistaken for. The Eastern Natal Green Snake occurs in Kwa-Zulu Natal on a narrow strip along the KZN coast line north of Amanzimtoti, through Durban and northwards to Kosi Bay, into Mozambique, through Swaziland with isolated records from Mpumalanga and the Limpopo border boarding Mozambique. These snakes favour the dense coastal thicket, these snakes may often enter homes which are built in such eco-estates along the north coast and built in pristine coastal forests. Feeding mainly on Tropical House Geckos, frogs and small lizards. These snakes will quickly escape when first noticed and are excellent climbers that will bite readily when handled. They bites from these snakes leave superficial bite makes that bleed freely for a few minutes after the bite. There are thought to be anticoagulant properties of their salvia but this needs further studies. Averaging around 70cm they can reach a length of 1.2m large specimens are easily confused for juvenile Green Mamba’s and a few people have been bitten over the years making that poor error in judgement. The young snakes are small averaging just 20cm from the egg and can easily be confused with the Green Water Snake. Eastern Natal Green Snake. From Saltrock, Kwa-Zulu Natal. Eastern Water Snake. From St Lucia, Kwa-Zulu Natal. Eastern Natal Green Snake. From Umhlanga Rocks, Kwa-Zulu Natal. An impressively coloured green snake often with hints of turquoise predominantly around the head and tail of the snake. The key identifying factors of these snakes which is often overlooked by amaetuer herptologists is the extreamly dark iris of the snake, the entire eye is practically black – easy to see from a side on shot. Often with blue flecks in between the scales which can easily be seen when the snake becomes aggravated and gently inflates the throat region to expose the brightly coloured skin. Commonly found among waterways, streams and around dams in Limpopo, North West, Gauteng, Mpumalanga, the Kwazulu Natal interior (Drakensberg, Natal midlands and southern parts of the province), Southwards of the Amanzimtoti river into the Eastern Cape, along the garden route and into the Western Cape. In certain parts of the garden route this snake is well documented for occurring in a melanistic variation (a complete black snake lacking any colour) it is the same species but simply a genetic abnormality like albinism in some animals. These snakes can get to an impressive size (maximum 1.3m) and girth and are often confused with Boomslang. They will bite readily when first captured and much like other members of the green snakes the superficial wounds will bleed freely for several minutes making rather nasty looking wound but it is of no concern. Western Natal Green Snake. From Morgan Bay, Eastern Cape. Western Natal Green Snake. From Mooi River, Kwa-Zulu Natal. Western Natal Green Snake. From Grahamstown, Eastern Cape. Western Natal Green Snake Bite – note excessive bleeding. Arguably the most impressive and iconic venomous green snake in Africa. The Green Mamba is an impressive snake averaging around 1.8m but can grow towards length of 2.5m. A brilliantly coloured lime green robust snake that seldom ventures down to the ground and spends the majority of its time in dense foliage and tree’s where it actively hunts its prey, such as birds, small mammals like rodents and squirrels. These snakes occour only in a narrow astrip along the coast, seldom venturng further than 7km inland. As a general rule of thumb, if you cannot see, smell or hear the sea you will not find Green Mamba’s there. The Green Mamba has an impressive coffin shaped head which is quite distinctive from the body and not easily confused with any of the other harmless green snakes. It has a lime green belly and bright green upper side with occasional with have the an odd few bright yellow scales. These are shy snakes are often will avoid confrontation and flee into foliage, bites are uncommon and usually on snake handlers who are attempting to catch these snakes. The Green Mamba is found all the way from Kosi Bay in the North down a narrow strip along the east coast just entering the Eastern Cape in the region of the Umtamvuna river which serves as the border between Kwazulu Natal and the former Transkei region. There are several unconfirmed reports of Green Mambas around the Port St John’s region but haven’t not be substantiated. Eastern Green Mamba. From Umkomaas, Kwa-Zulu Natal. Eastern Green Mamba. From Umhlanga, Kwa-Zulu Natal. Both species of Boomslang differ dramatically in colour from the juveniles, subadults and adults. At around 1m in length Boomslang begin to transition from the vibrantly coloured juvenile colouration to their adult colour. In the case of the Common Boomslang, adult females are generally grey/brown or olive in colour however this is not set in stone and they can also be green/green with black edging on the scales. The male Common Boomslang is typically a vibrant bright green or green with black edged scales. Boomslang are naturally shy snakes seldom venturing down to the floor except for water or seeking prey. These snakes can reach close to 2m in length but average around 1.5/6m. Bites from these snakes are exceptionally rare on people, although bites do happen there is a specifically created antivenom to treat these bites – monovalent antivenom. As seen from the distribution map below, green Boomslang are largely absent from the Western Cape and southern parts of the Eastern Cape. In these area’s the Cape Boomslang is typically Black and yellow or orange sometimes brick red in males whilst females are grey,brown or olive in colouration. Common Boomslang. From Hluhluwe, Kwa-Zulu Natal. Common Boomslang. From Vaalwater, Limpopo. After reading text and using the accompanying images as a guide you should be better equipped to correctly identify the various green snakes in South Africa you may come across. Atlas and Red List of the Reptiles of South Africa, Lesotho and Swaziland. Suricata 1. 2014 A. Bauer, M. Burger, M.Bates, J. Marais, G.J. Alexander & M.S. de Villiers (eds). This entry was posted in Durban, Eastern Cape, Green Snakes, Harmless Snakes, Herpetology, Kwa Zulu Natal, Limpopo, Mpumalanga, Photography, Reptiles, snakes, South Africa, Southern Africa, Travel, Western Cape and tagged Boomslang, Bush Snake, Dendroaspis, Dispholidus, Green Mamba, Green Snakes, Green Water Snake, Natal Green Snake, Philothamnus, South Africa. Thank you Johan much appreciated! I read your article with a kind of concerned interest, as of late my hubby has intercepted a few green snakes in the grounds of our residence, mostly appearing to exit between the brickwork spanning our driveway. Admittedly I am nervous, not being very well educated on snakes so actually terrified of them. However, that aside, we have young adventurous, incredibly quick daschund dogs , who have already harmed some snakes they have caught. From your article, it appears these long, slender green snakes could be the eastern natal green variety, as My hubby Harry confirmed they have a bright luminous green head and pale yellowish belly and very very fast (when the dogs haven’t got to them). Do they inhabit and return to the same place year round, which seems to be the rain gaps in our brick wall and do you recommend that we call a local snake catcher. Many thanks. Livvy and Harry Simpson, Umzumbe, KZN south coast. Hi there, most likely a Harmless Western Natal Green Snakes they are quick moving and feed on small frogs and geckos. Usually, nothing at all to worry about. You do get Green Mamba’s down there but they will stick to the dense vegetation. 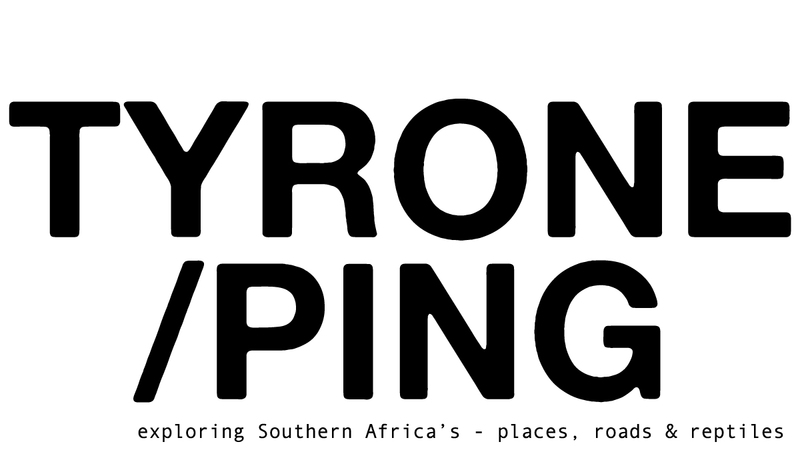 If you manage to snap any photos you’re welcome to email me at contact@tyroneping.co.za and I can ID them for you.